I just read the whole 44 page report and thought it was great. You did a good job of taking data and packaging it in a way that systems, providers and parents and kids can all understand...no easy accomplishment. I appreciate the work y'all put into this and wanted to say thanks. This report is great! I like the data. It really gives me a better understanding of how youth feel the process works, which helps me know areas where I need to advocate more. We have worked with our EMSTAR Research Consultant, Dr. Kimberley Broomfield-Massey for over 10 years. Dr. Broomfield-Massey develops practical approaches that are executed with a high level of professionalism and passion. She is very knowledgeable and extremely easy to work with. Dr. Broomfield-Massey consistently goes above and beyond, and for that, we are truly grateful. We are extremely impressed with EMSTAR and delighted to be an EMSTAR client. I am especially impressed with the annual evaluation report Michelle and her team developed. Thank you! Thank you for your help in the transition process, troubleshooting, quick responses, great involvement, accountability, and everything you’ve done to help us. You are truly GREAT! Having the EMSTAR team as colleagues is such a joy. I am most appreciative of your work. With gratitude and thanks. We are on GSA Professional Services Schedule. Our years of experience will help you focus on critical issues for assessing the needs of your program or organization. We can develop the methods and instruments necessary to collect the data that will identify the needs in your community, organization or program population. We specialize in logic model development to help your organization frame your theory of change. Using your new logic model, we can help you structure your resources in a strategic manner, to maximize achievement of your short-term and long-term goals and objectives. Through that methodical approach, a user-friendly outcome evaluation plan will evolve. 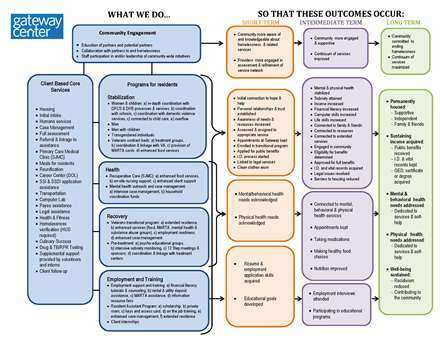 Below is an example of a client's logic model (provided with permission of the client). You can click on the image to make it larger. We can assist in developing evaluation components and instrument design for new programs. We can review your existing programs by collecting baseline and ongoing data and conducting all necessary data analyses. For the well-defined program, we can provide the evaluation expertise to satisfy your needs and the requirements of funding agencies. We specialize in both process and outcome evaluation as well as economic evaluation. We also provide evaluation technical assistance. We develop and disseminate stakeholder friendly and comprehensive written evaluation reports to both document your successes and provide recommendations for improvement. We can design and conduct appropriate data analyses on existing databases to provide your business or program with invaluable feedback. We also specialize in data collection, management, and quality assurance. We can help with your quantitative and qualitative data needs. We have extensive experience in data analysis techniques including multivariate analysis, structural equation modeling, hierarchal linear modeling, multiple regression, reliability analysis, factor analysis, multiple imputation, qualitative analysis, network analysis, and ecological/observational assessment. We can turn this ..... into this!